Jagdish N. Sheth, Ph.D., is the Charles H. Kellstadt Professor of Marketing at Emory University, Goizueta Business School. He is known nationally and internationally for his scholarly contributions in consumer behavior, relationship marketing, competitive strategy, and geopolitical analysis. When he joined Emory’s faculty in 1991, Professor Sheth had nearly 30 years of combined experience in marketing from the University of Southern California, the University of Illinois, Columbia University, and Massachusetts Institute of Technology. Throughout his career, Professor Sheth has offered more than a thousand presentations in at least 20 countries. He has also provided consultancy for numerous companies in the United States, Europe, and Asia. His client list includes AT&T, BellSouth, Cox Communications, Delta, Ernst & Young, Ford, GE, Lucent Technologies, Motorola, Nortel, Pillsbury, Sprint, Square D, 3M, Whirlpool, and others. Currently, Professor Sheth sits on the Board of Directors of several public companies including Norstan, Cryo Cell International, and Wipro Limited. Professor Sheth’s accolades include “Outstanding Marketing Educator,” an award presented by the Academy of Marketing Science, the “Outstanding Educator” award twice-presented by Sales and Marketing Executives International, and the P.D. Converse Award for his outstanding contributions to theory in marketing, presented by the American Marketing Association. Professor Sheth is the recipient of the two highest awards given by the American Marketing Association: the Richard D. Irwin Distinguished Marketing Educator Award and the Charles Coolidge Parlin Award. 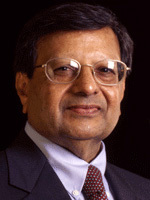 In 1996, Professor Sheth was selected as the Distinguished Fellow of the Academy of Marketing Science. The following year, he was awarded the Distinguished Fellow award from the International Engineering Consortium. Professor Sheth is also a Fellow of the American Psychological Association (known as APA). In 2014, he was awarded the William Wilkie Award, Marketing for a Better World by the American Marketing Association. Professor Sheth has authored or coauthored hundreds of articles and books. In 2000, he and Andrew Sobel published the best seller, Clients for Life. In 2001, Value Space, which he coauthored with Banwari Mittal, was published. Professor Sheth’s most popular book, The Rule of Three, was coauthored with Dr Rajendra Sisodia and published in 2002. He has since written notable publications: Tectonic Shift, Firms of Endearment, and The 4 A’s of Marketing.